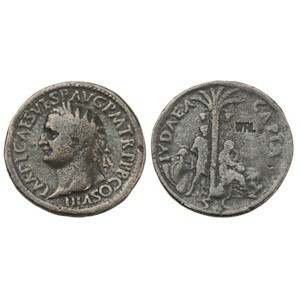 Obverse: Laureate head of Vespasian left. Text Around IMP I CAES VESP AVG PM TRP PP COS VIII. Reverse: Judaea seated right, resting head on hand, in attitude of mourning; palm tree in centre, standing captive to left with hands bound behind back with shields and spears behind him. Text to left IVDAEA Text to Right CAPTA, Text in exergue S C.
History: This coin was struck to commemorate the Roman victory over the Jewish insurgents in the Jewish War. The war began in AD 66 and was basically over by AD 70 when Jerusalem was captured, and destroyed, by Titus; although isolated groups of fighters continued to resist until the fall of Masada in 73. The reverse of this coin symbolises the Roman victory perfectly: on the left we see a captive with hand bound; the palm tree at the centre was the symbol of Judaea, thus making the scene perfectly identifiable; and the mourning woman is a personification of Judaea.